The Philippines’ oldest candidate for senator and the oldest among all candidates in the May elections says saluyot or jute, a popular vegetable in the Ilocos region, is the secret to his long life. “My secret in fighting aging is saluyot, said former senator and Senate president Juan Ponce Enrile who will turn 95 on Valentine’s Day. “I eat dinengdeng. That’s what I eat every Sunday,” Enrile told 92.3 News FM. Dinengdeng is a bagoong-based soup dish made from vegetables such as saluyot or jute leaves and topped with grilled or fried fish. But Enrile, a four-term senator, says he follows no strict diet. “I eat lechon, chicharon, adobo, pork chop and bagnet,” he said. Enrile says he controls the amount of rice he eats. He sleeps for eight hours and maintains a regular exercise routine. In response to questions on his longevity, Enrile posted on his Facebook page that he continues to drink alcohol but has quit smoking. “I began smoking cigarettes when I was 10 years old. I stopped when I was sixty years old. I used to consume between two and three packs of cigarettes a day. 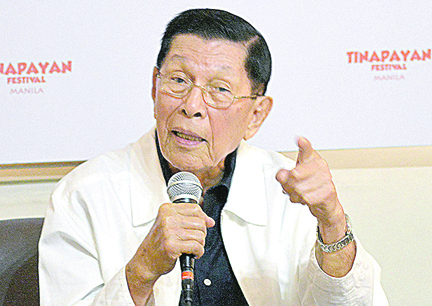 As he gears up for the campaign period, the Enrile allayed doubts on his capacity to campaign for the coming elections. “How I feel today is the same way that I felt when I was 70, the same way that I felt when I was 60,” he said. To keep his mind sharp, Enrile says, he reads books covering the economy, foreign policy, history, and geography. He also uses the Internet to research on trending issues after his last year as Senate president in 2016. He says he responds to the questions and comments on his Facebook page, adding he is “self-taught” in using the computer. “I think man can adapt to its environment, for one thing. If you are not lazy to learn, even an old man like me can learn the things that are known and familiar to the young,” Enrile said. “Your brain can be as young or as old as you want it to be. If you want to have a young brain, just don’t use it. If you want an old brain, fill it with ideas and information. If elected and assuming he finishes his term, Enrile would be he would be the oldest serving politician at 101 years old.